At Queen Victoria School our main aim is to cultivate as near as possible a ‘home from home’ environment where pastoral care is of the utmost importance. We pay close attention to the particular needs of our pupils, who all have a service background, through a focus on providing a safe, happy and stable environment in which they can live and learn. The Boarding House system with its pastoral tutorial structure enables staff to provide a planned, yet relaxed, routine essential to the successful development of each pupil. There are four Boarding Houses – Cunningham, Haig, Trenchard and Wavell. Each House has a House Team led by a Housemaster or Housemistress, a Deputy and an Assistant Housemaster or Housemistress, as well as a Housematron. Cunningham and Haig accommodate boys from S1-S6, Wavell accommodates girls from S1- S6 and Trenchard, which is the junior co-educational House, accommodates girls and boys from P7- S2 along with six senior girls from S5 and S6 who act as prefects and ‘big sisters’. Our pupils from P7 – S3 live in rooms for two, three or four pupils and nearly all S4, 5 and 6 pupils have single rooms and the facility for private study. Each House has its own recreational facilities and the pupils have access to the School’s extensive facilities and playing fields. The shared vision of Trenchard House is to provide a safe, welcoming environment where support is always available to meet the pupils’ academic, emotional, physical and social needs. Like all of the children that join Trenchard House, Marshal of the Royal Air Force Hugh Montague Trenchard, 1st Viscount Trenchard GCB OM GCVO DSO also boarded at a Preparatory School (in Hampshire) from the age of ten. And just like Hugh Montague Trenchard who was quoted in April 1925 speaking to the Cambridge University Aeronautical Society: “We open our ranks widely to all”, Trenchard House opens its doors to all young children who wish to strive for success and fulfil their potential academically, in Drama, Music, Sport or any other activity. Trenchard House is the only Junior Boarding House in the School, catering for both boys and girls from Primary 7. We try to ensure that the pupils are happy and comfortable in their new surroundings, thus improving their opportunity to succeed in class. 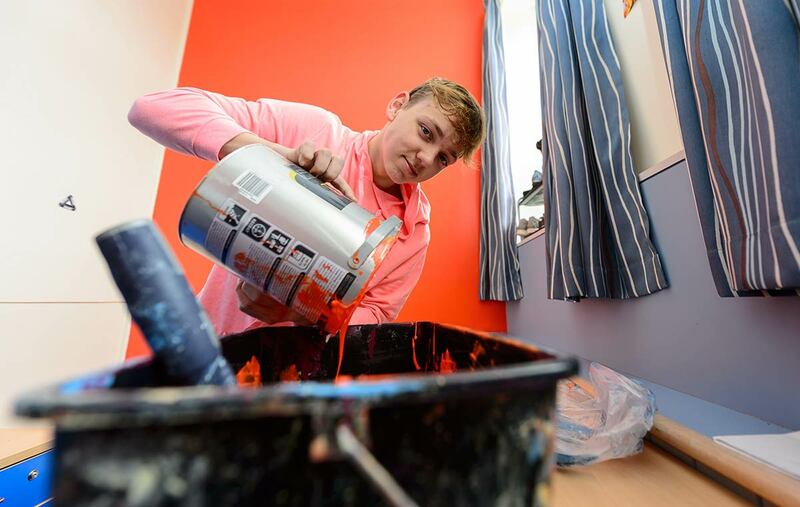 For many pupils it will be their first experience of living away from home and it is therefore essential that Trenchard staff make it their priority to ensure first class pastoral care. Support is provided to both the pupils and their families to ensure that the children have the best opportunity to settle into boarding school life with confidence, independence and enthusiasm. We try to provide an ideal ‘home from home’; to facilitate a smooth transition from a junior day school to senior boarding school life at Queen Victoria School. The House staff work in close liaison with parents in seeking to encourage independence, maturity and responsibility in every child who becomes a member of Trenchard House. We, with the help of parents and families, look to promote respect, discipline, honesty and compassion in order to create a well rounded, thoughtful pupil, who is willing to apply themselves positively to life.